UK-based artist Jane Perkins obtains her inspiration in found objects. She uses anything from toys, shells, buttons, beads, jewelry etc. as material for her re-interpreted contemporary art. Inspired by impressionist artist and famous portraits, Perkins achieves a mesmerizing effect in her creations. Her work keeps your eyes attached from a distance view and a close-up as well with so many interesting small pieces perfectly arranged to masterpieces. Hungarian singer Boggie has created a music video in which she is digitally retouched from normal girl into glamorous pop star. Through a combination of CGI trickery and seamless editing, the video for “Nouveau Parfum” is so attention grabbing, it’s hard to look away. The on-screen effects come in such subtle doses that it doesn’t draw attention away from the song. Old Spice has reenlisted former Old Spice Guy Isaiah Mustafa for Interneterventions, the new online initiative pushing the brand’s body sprays. The campaign is built around nine bogus websites that advertise gawdy, faux-manly products and services—like black leather sheets, a live-in gym and a solid gold bluetooth—and Mustafa’s over-the-top disdain for all of them, and anyone who would be sucked in by them. Users can send the sites to friends as a prank (via Twitter, Facebook or email), and when they try to click around, a warning buzzer sounds and Mustafa appears to offer help for poor lifestyle choices. Japanese London-based photographer Chino Otsuka has created a series of nostalgic and heartwarming photos that combine two different worlds–the past and the present. 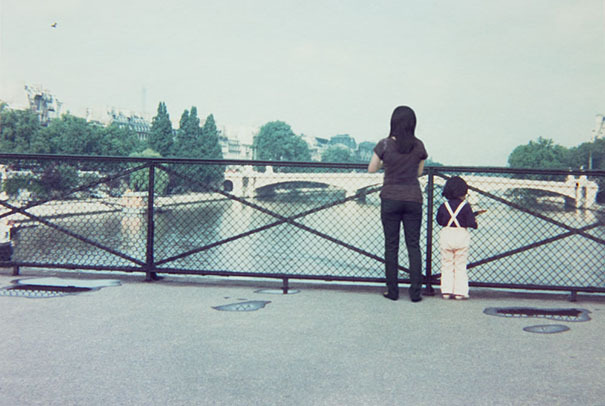 In “Imagine Finding Me,” Chino digitally inserts herself into old photos, so that she is standing next to her younger self. The concept is simple and her digital manipulation of the photos is done so well it makes it seem she is a time traveler. Thanks to Kelly Keirn for today’s fodder.